AuLika Top One Touch High speed model is the perfect combination of aesthetics & professional performance. It has a clean, rational design and unparalleled technology, double hydraulic circuit, conical blades, large water & Beans container. These characteristics make AuLika, perfect for high daily consumption locations. 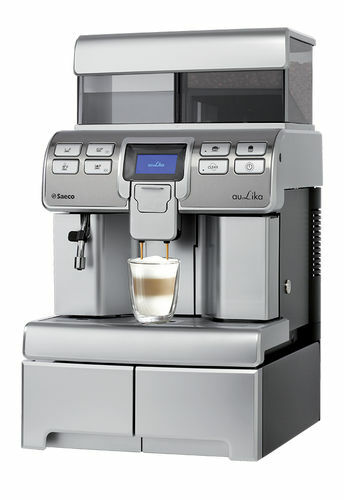 Dispenses the following programmed coffee products at the push of a button. All AuLika Top model delivers a wide range of coffee-based & fresh-milk-based beverages, as well as hot water & steam. The wide graphic display can manage both icons & text messages in several languages. The interface has 8 selection keys help easy to program & operate the machine. CLICK HERE for presentation Video. Cleaning & maintenance activities, too, are made easier by the fact that all components requiring regular checks can be removed. The Aulika Top version is integrated by a base with extra capacity for grounds collection & can also be connected directly to the water supply. 2 coffee cups simultaneously one after the other. Saves 20 seconds to deliver product in the cup. Steel conical blades - the best tool for uniform grind.